Every teen suicide is hard to take. Each time I write about another one, it takes another piece of my own soul. And, there are some that I take very, very hard. Jamie Hubley, for example, hit me like the ton of bricks. To be sure, it was his suicide in October that led me to embark upon this campaign to make a change. Kenny Wolf’s recent suicide hit me as hard, if not harder. He was right here in my back yard, right there from my old neighborhood. I know it’s counterproductive to blame myself at all, but I can’t help but wonder…with me doing this right here in Maryland, why wasn’t this blog or the facebook blog page reaching him? And, if it was, what could I have done differently with it to prevent this from happening? Second-guessing aside, I have some vital updates about Kenny. Firstly, all reports of age were wrong: Kenny wasn’t 17, as originally reported, nor even 16 as it was later reported. Kenny was just 14 years old. Secondly, his event wasn’t Thursday, the 5th. It happened Friday, the 6th. Thirdly, I have a link for those who would like to leave their personal condolences for the family and friends. It goes without saying that this is an extraordinarily tough period for Kenny’s family and friends. Indeed, for the entire community. Letting them know that there are those of us around the world who are mourning Kenny right along with them will, I’m sure, help with their healing process. Lastly, I can’t stress enough that if you or someone you know is struggling with depression, or any mental issues, bullying, and/or suicidal ideations, please, please, please reach out!! There are many people, professional and non-professional alike, ready to reach back. With this tragic event being right here in my backyard, I’m redoubling my efforts to reach out and bring this epidemic to an abrupt end. Sadly, of course, it’s not going to bring Kenny back. Or, any of the other teens who ended their lives far too soon. But, it will, hopefully, prevent another family from having to go through what Kenny’s is going through right now. That’s my promise. When it hits this close to home, it’s really painful for me to think about. According to information just received, Kenny Wolf, a 14-year-old freshman at Olde Mill High School in Maryland, successfully attempted suicide yesterday, Thursday April 5th. According to a memorial page set up on the popular teen site, tumblr, Kenny had been constantly bullied because of being an LGBT teen. The information hit me like a Mack truck. I lived in that neighborhood for a while. 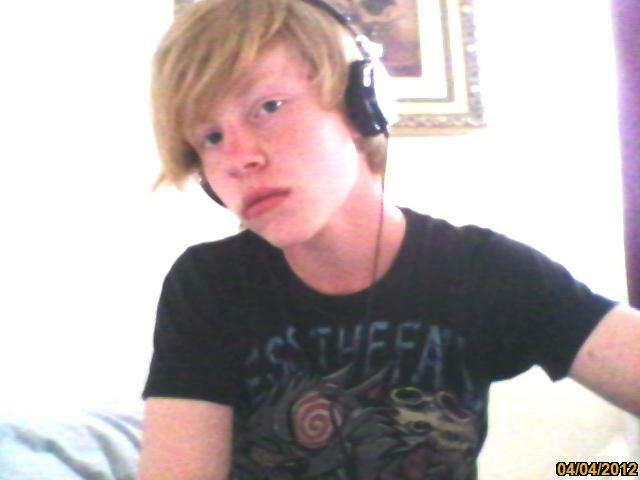 When I saw his facebook picture, taken just the day before his suicide, I just wept. No, I didn’t know him. I lived there when he was just 6 or 7 years old. I didn’t need to know him, though. I know that he was another teen, just trying to become, but because of other people’s hostilities, is now gone forever. I don’t think it can be said enough that this whole epidemic of bullying has to be met head-on, and dealt with as seriously as any other epidemic that hits our society. It was said that “if teens were dying at this rate because of a medical outbreak, everyone would be in a panic.” I agree. As such, the same intensity has to be applied to the problem of bullying, and the suicides that it’s leading to. The more I learn, though, the more I realize that it could be easier said than done at this point-in-time. Why? Well, where do we start? The easy answer would be to hold these young people accountable for the consequences of their bullying. And, I believe that to be true. If they knew, without a doubt, that their bullying would lead to severe consequences especially in cases where it led to suicides, they would think twice before doing it. After all, if those same kids were to take a weapon to school and physically harmed or killed another student, wouldn’t they be charged for a crime? And, depending on the severity of the outcome, they would potentially be charged as an adult. What, then, is the difference between that action and bullying someone to a point where he or she ends their life? On a real core level, especially to the family and friends of the victim, there is no difference. In either case, their loved one is gone forever. However, that’s the easy answer. Our society, especially in this country, already has a lock-’em-up-and-throw-away-the-key mentality. It doesn’t “cure” a thing. And, it doesn’t bring anyone back. The long-term solution absolutely has to be a re-education of our culture beginning with the adults. Once again, I will say that these young people aren’t born to hate, discriminate, or be intolerance. They. Are. Taught. They are taught, either directly or indirectly, by adults. Listen to the rhetoric from the extremist’s corner. Watch, again, what a “pastor” “preaches” to his “congregation” about the LGBT community. These are the people who tell the young bullies, either directly or indirectly, that it’s ok to treat LGBT teens, real or perceived, as mean as they want to. These extremists send the signal that even physical harm is acceptable when it comes to LGBT teens. And, that is what has to be addressed quickly, and severely. Forget their claims of freedom of speech. Freedom of speech does not include hate speech. Their idea of “freedom of speech” is costing lives and destroying families. That is not acceptable. Not anymore. Kenny has been gone for just over 24 hours, so his family and friends are still raw with unimaginable pain. Send them lots of love and support. And, prayers. And, while you’re praying to a God that loves, pray that He works on the hearts and souls of the people, young and old, who spread harmful hatred and intolerance. It’s time for a change. Rest in peace, Kenny. No one can harm you now.